The Sanderling is a small, wading bird that breeds in the high Arctic and winters along coastal beaches on the Pacific and Atlantic coasts of both North and South America. It stops in Tennessee during migration and is usually found on sandbars, exposed mudflats and along lake edges across the state, but more frequently along the Mississippi River. This is the shorebird that when foraging on the coast will chase waves to and fro, probing the sand for invertebrates. Description: This small, plump, pale sandpiper is typically found in non-breeding plumage in Tennessee, which is white below, pale gray above, with a small dark shoulder-patch usually visible at the bend of wing. The bill is short, straight and black, as are the legs and feet. A relatively broad white wing-stripe bordered by black is visible in flight. Breeding plumage birds vary considerably in brightness with the head, breast, and back ranging from mottled reddish to sandy brown. Spring migrants may be in transitional plumage. Juvenile birds (July - November) are similar to nonbreeding adults but are mottled black and white on the back. Voice: Common call is a short, hard klit or kwit. In nonbreeding plumage, similar to other small sandpipers but is whiter below and on the face, and the short, straight black bill should distinguish this species from others shorebirds. Habitat: In Tennessee, found on sandbars, exposed mudflats and along the edges of ponds and lakes. Nesting and reproduction: Sanderling breed in the high arctic tundra and have a circumpolar breeding range. Status in Tennessee: Rare but regular migrant throughout Tennessee, found more frequently found in fall especially along the Mississippi River. Spring passage through Tennessee is from late April through May, and from mid-July into early November in fall. The Sanderling is one of the most widespread wintering shorebirds in the world. It is found on nearly all temperate and tropical sandy beaches of all continents. Best places to see in Tennessee: Typical shorebird locations are likely locations, including Old Hickory Lake and Rankin WMA. Macwhirter, B., P. Austin-Smith, Jr. and D. Kroodsma. 2002. 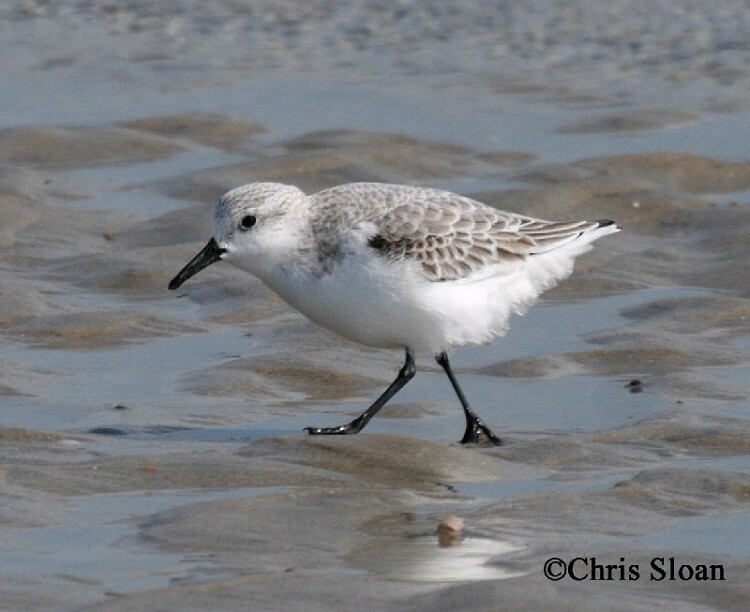 Sanderling (Calidris alba), The Birds of North America Online (A. Poole, Ed.). Ithaca: Cornell Lab of Ornithology.